By late Wednesday afternoon, public testimony in a cramped committee room had exceeded four hours. During the first few hours of the public hearing before the Legislature’s education committee, Maine residents who had traveled from across the state listened to the hearing from three overflow rooms, many still waiting for their turn to testify. One bill, LD 798, from Rep. Ryan Tipping, D-Orono and Sen. Linda Sanborn, D-Gorham, would remove parents’ option to claim non-medical religious or philosophical exemptions to avoid vaccinating their children. The bill would effectively require those parents to vaccinate their children before they enroll in public schools, as stipulated by new Maine Department of Education and Department of Health and Human Services rules. 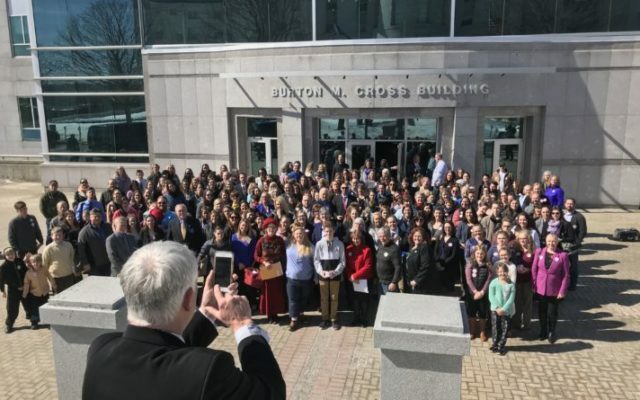 “We have a threat sitting there, and we want to make sure we take action,” Tipping said Wednesday, referencing DHHS data that show Maine’s rate of unvaccinated kindergarten students claiming a non-medical exemption is at 5 percent. While vaccination rates have hovered above 90 percent since at least 2013, Maine’s unvaccinated population of youngsters is still more than double the national rate — the majority of which claim a religious or philosophical exemption. During their testimony, several proponents of eliminating non-medical exemptions pointed to Maine’s rising pertussis rates and the 2017 measles outbreak — the first in 20 years — as evidence that not vaccinating still poses an active risk. The counter bill from Sen. Russell Black, R-Wilton, LD 987, would protect parents’ and medical professionals’ autonomy to choose against vaccinating by expanding ways parents could claim a medical exemption. The bill also removes the authority of relevant governing boards from enacting immunization laws beyond what’s currently required by the state. “If we trust medical professionals to decide who can safely be vaccinated, why do we not trust those same medical professionals [to decide] who cannot be safely vaccinated?” said Rep. Heidi Sampson, R-Alfred, a co-sponsor of LD 987. “Without this bill, parents will be asked to play Russian roulette. The weapon? A vaccine,” she said. During early testimony, Democrats — including the administration of Gov. Janet Mills but with the exception of Sen. David Miramant, D-Camden — advocated for Tipping’s bill while Republican lawmakers generally backed Black’s bill, with some saying it would be required as a check on Tipping’s bill if it were to pass. Public testimony ran the gamut. Support centered on public safety risks and concern that unvaccinated children could unintentionally cause epidemics of diseases that had been largely eliminated by immunization programs. Opposition mixed libertarian advocacy for personal and parental rights with skepticism based on questionable science and tragic personal anecdotes. Proponents, including doctors and nurses, said medical exceptions are rare and maximizing the proliferation of vaccines should supersede individual choice. Some pointed to the recent New York City incident in which an unvaccinated student spread measles to 21 other students as proof of the looming risk that comes with not vaccinating. But opponents defended their right to choose whether to invite the risk that comes with vaccination, including grieving parents whose children either died or were made sick after receiving vaccinations. Others asked for explicit language in LD 798 that would provide flexibility when claiming a medical exception. Pat Endsley, a nurse at Wells High School speaking on behalf of the Maine Association of School Nurses in favor of LD 798, said she is often sought out as a resource for parents navigating immunization, and her advice is fairly uniform: vaccines are the answer, as they are “essential [in the] prevention of disease.” While “legitimate medical exceptions are necessary,” she said, true exceptions are rare and they should be strictly regulated by the state, she said. But Morgan Silver, a Quaker mother of 12 from Phillips, said enshrining parental choice should also be protected. “I don’t want that choice taken from me,” Silver said, adding that she generally believes in medical care and chose to have her children vaccinated. The committee will hold work sessions on both bills before voting on recommendations to the full Legislature.